Garmin VIRB 360 is another add up to the action camera lineup into the world of 360-degree video. 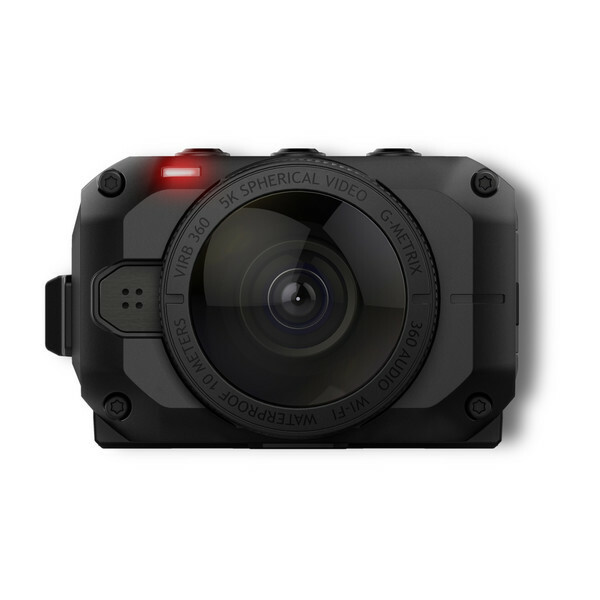 Recently, the company announced the VIRB 360, a waterproof spherical camera packed with bleeding-edge specs. The new camera offers features that most other 360-degree cameras lack, but that comes at a price: the VIRB 360 will cost $799 when it goes on sale in June. The VIRB 360 shoots spherical, VR-compatible video at a resolution of 5.7K, and it does it at 30 frames per second. It can take 15-megapixel stills, which are good enough to make it one of the highest-resolution consumer 360 cameras on the market. It’s not just about resolution, though — after all, that resolution is spread around the entire spherical image. It’s hard to find a more feature-packed 360 camera than the Garmin VIRB 360 action camera, which is why it’s so expensive. The camera has four built-in microphones that, working together, capture 360-degree audio to match the video. It automatically stabilizes and stitches the footage in-camera instead of offloading that processing to your phone, too. And there’s also a live-streaming feature, which is compatible with YouTube and Facebook Live. All told, users should expect about an hour of battery life, all depending on which of these modes and settings they use. The thing that could set Garmin’s 360 camera apart from the competition is how it allows users to create data overlays — something the company has been doing for a while with its more traditional action cameras. The camera can measure everything from speed, altitude, and distance traveled; it can even calculate stats like hang time and jump height. 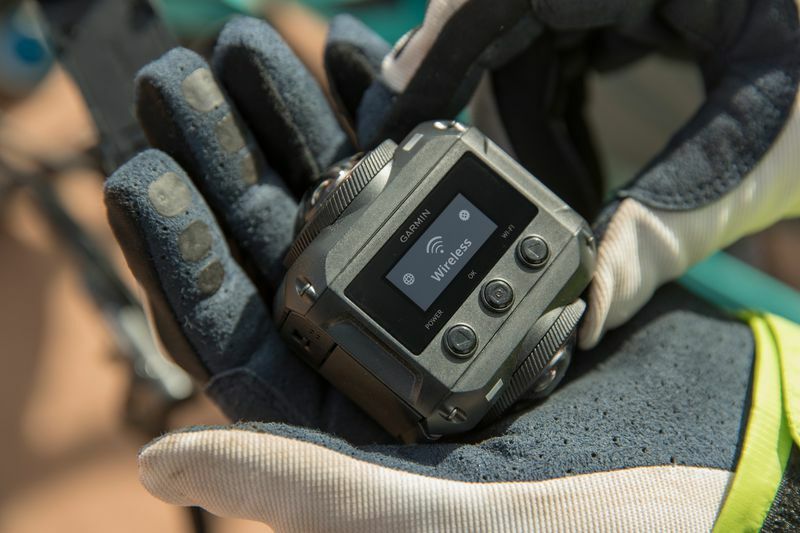 Garmin VIRB 360 also has built-in GPS and GLONASS and is compatible with Garmin’s heart rate monitoring accessories. All of that data can be overlaid on the spherical video or photos, and the placement of it can be customized. Garmin calls it “augmented reality” in the VIRB 360 press release, and even if that’s not quite right, it’s still a pretty cool idea. Is all that enough to make the VIRB 360 a more attractive option than the $400 Nikon KeyMission 360, or the even cheaper Samsung Gear 360? Probably not. But with GoPro announcing that it’s only going to ease into this space — the company is running a pilot program for its own 360-degree camera ahead of a full consumer release sometime at the end of 2017 — Garmin might be able to get a head start on cornering the adrenaline junkie section of the nascent 360-degree photography market. 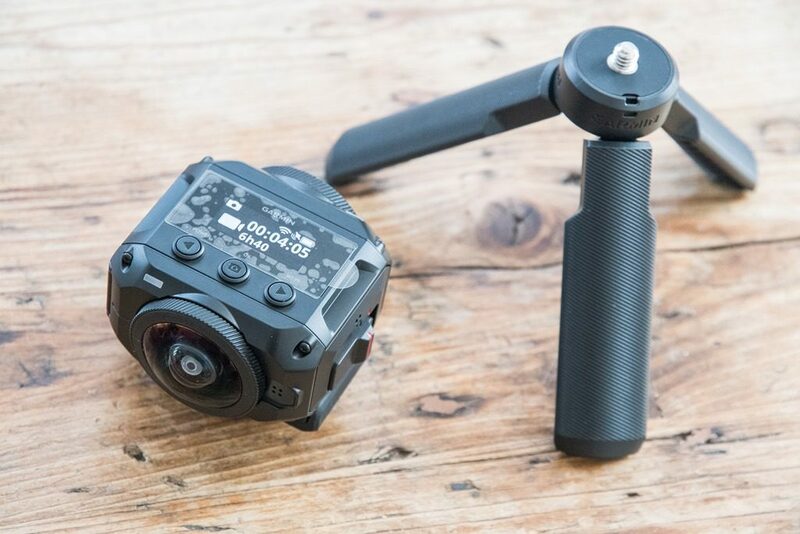 Garmin VIRB 360 action camera comes with a small tripod as well.